Triumph of Masterworks: Our National Pride III, part II is a group art exhibition showcasing senior and mid career artists of India, who are constantly working on their individualistic style and already making marks in this field contributing legacy to Indian art scenario. This exhibition is a significant part of celebrating 72st Independence Day this year presented by New Delhi Municipal Council and organized and curated by Kishore Labar. Triumph of Masterworks: Our National Pride presents 32 contemporary artists from India, who are effectively exploring various methods, materials and techniques for year after year, producing distinctive artworks and regularly showcasing their experimental outcome in a range of forms like drawing, painting, sculpture, installation and many more. Triumph of Masterworks: Our National Pride highlights the passionate creation of working artists who are committed to their art and express their insightful views about life and time through unique visual interpretation that adds delightful pride to the nation. Celebrating 72st Independence Day means to celebrate our progress and advancement in every aspect of our living life and notion. 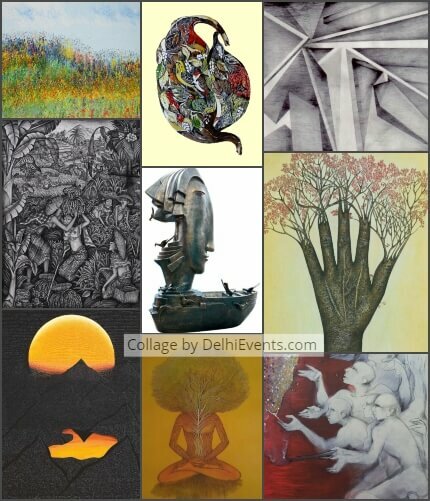 As art is an all embracing notion that plays significant role in development of human mind, artists offer diverse range of creative impression reflecting the original state of growth and enrichment of a developing country; organizing art event as a part of celebrating independence featuring creative achievement by the artists represents the idea of rising India… expanding India……attaining India.